10 tips for navigating the raw bar like a pro. Oysters are strange things to love. The briny little bivalves are housed inside of hard shells that diners tip back into their mouths, sending the still very-alive little fellows down the gullet, sans chewing. To novices and non-devotees, the whole practice seems bizarre and even repulsive. And yet the mollusks attract a cult following—these days, it’s almost an anomaly when a hot new restaurant doesn’t have a raw bar, and $1 oysters are the new 25-cent wings at many bars around the country. Whether you’re a newb or a seasoned veteran, there are a few facts that everyone should know about the almighty oyster. The experience of ordering and eating the things can be a bit intimidating—and, in rare cases, dangerous—if you don’t know what you’re doing, but this 10-step primer will give you the tools to navigate the raw bar like a pro. Click through the slide show to have all your burning oysters questions answered by two shellfish pros. Sandy Ingber (left) started at Grand Central Oyster Bar in 1990 as the fish buyer, expediter, and purchasing agent. He became the chef in 1996 and has remained in the role ever since. 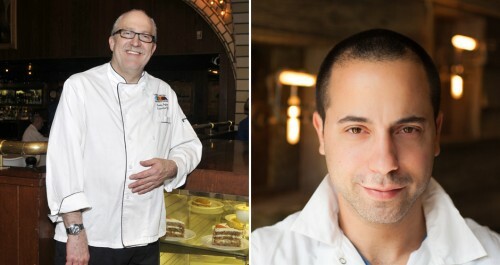 Todd Mitgang (right) is the chef-owner of Crave Fishbar on the Upper East Side and South Edison in Montauk. He has oysters delivered regularly to his doorstep at his home in Long Island. Oysters are strange things to love. The briny little bivalves are housed inside of hard shells that diners tip back into their mouths, sending the still very-alive little fellows down the gullet, sans chewing. To novices and non-devotees, the whole practice seems bizarre and even repulsive. And yet the mollusks attract a cult following—these days, it&apos;s almost an anomaly when a hot new restaurant doesn&apos;t have a raw bar, and $1 oysters are the new 25-cent wings at many bars around the country. Whether you’re a newb or a seasoned veteran, there are a few facts that everyone should know about the almighty oyster. The experience of ordering and eating the things can be a bit intimidating—and, in rare cases, dangerous—if you don’t know what you’re doing, but this 10-step primer will give you the tools to navigate the raw bar like a pro. Click through the slide show to have all your burning oysters questions answered by two shellfish pros. Sandy Ingber (left) started at Grand Central Oyster Bar in 1990 as the fish buyer, expediter, and purchasing agent. He became the chef in 1996 and has remained in the role ever since. Todd Mitgang (right) is the chef-owner of Crave Fishbar on the Upper East Side and South Edison in Montauk. He has oysters delivered regularly to his doorstep at his home in Long Island. 1. Are oysters seasonal, or can you eat them year-round? 2. Are wild oysters better than farmed? 3. What’s the deal with the oyster grading system? Sandy Ingber: “There are different grades of wild oysters. Standards are usually the least expensive, and they are usually elongated and the meat is skinny inside. The quality is usually not as good. The Selects are more beautiful, cupped oysters, as are the Premiums. When it comes from a farmer, if he has oysters that are not as aesthetically beautiful as other oysters, he’s not going to be able to get as much money for those, but flavor is not involved." 4. What are the key differences between East Coast and West Coast oysters? 5. Are oysters from the Southeast U.S. any good? 6. Does the age of an oyster matter? 7. What should you look out for if you’re buying oysters for yourself? 8. Should you trust $1 oysters? 9. What tips do you have for someone eating oysters for the first time? 10. What is the key to shucking? Page 5. Are oysters from the Southeast U.S. any good? Page 7. What should you look out for if you’re buying oysters for yourself?